Hey everyone! So, I wrote a paper a few months ago on color and the different symbolic, psychological and spiritual meanings each color has had over different times and cultures, and I thought it’d be fun to share some of the information I had collected on that. What inspired me to do this was actually a book I was reading at the time – titled Color by Betty Edwards (which is an awesome book and I highly recommend reading) – but I was a bit disappointed by how brief and limited her interpretations of what the different colors meant towards the end of the book. So I was like, “there’s way more to it than just that,” and started collecting my own information on color symbolism. Color is one of the most powerful tools an artist has. The colors the artist chooses (or lack thereof) has an immense impact on the viewer’s emotional and intellectual response to the artwork. Most artists are aware to at least some degree that using certain colors in certain combinations creates a pleasing aesthetic; and that certain colors are almost always used to represent certain emotional states or to indicate certain attributes (for example, almost everyone knows that using bright, vibrant colors gives the impression of happiness, or that a drawing of a pool of liquid plus the color red equals blood). What most people are not aware of is that, emotions and reality-based observations aside, color has far more uses and more complex meanings. Keep in mind I do not claim to have all the information that there has ever been on each color, nor is it a strict set of rules that you need to follow when choosing suitable colors for your art – after all, art is subjective – and so is color – and what one color means to me could mean something totally different to someone else. Or if you’re colorblind, well, then I don’t know why you would be reading this. Anyway, here are just some fun and interesting stuff about the color red…I hope you all find it helpful, or at least entertaining. Haha! Red has been shown to increase blood pressure and stimulate the adrenal glands. The stimulation of the adrenals glands helps us become strong and increases our stamina. It also has an effect on all physical desires – sexual, appetite and cravings. This is why a lot of restaurants use red in their designs, and why red is a popular color for lipstick. While red has proven to be a color of vitality and ambition it has also shown to be associated with anger. Red is associated with sexuality, energy, anger, warnings, danger, war, blood, aggression, passion, assertiveness, violence, rebelliousness, confidence, courage, bravery, revenge, determination, power, heat, fire, attention-getting, lust, and love. In Eastern cultures, it can also symbolize luck, purity, good fortune and happiness. Red is traditionally associated with socialism and communism. The oldest symbol of socialism (and, by extension, communism) is the Red Flag, which dates back to the French Revolution in the 18th century and the revolutions of 1848. The color red was chosen to represent the blood of the workers who died in the struggle against capitalism. Almost ironically, the conservative American right-wing also uses red as their identifying color. In the Middle Ages, ships in combat hoisted a long red streamer, called the Baucans, to signify a fight to the death. In the 17th century, a red flag signaled defiance. A besieged castle or city would raise a red flag to tell the attackers that they would not surrender. Red is one of the five colors which are said to have emanated from the Buddha when he attained enlightenment, or nirvana. It is particularly associated with the benefits of the practice of Buddhism; achievement, wisdom, virtue, fortune and dignity. It was also believed to have the power to resist evil. In China red was commonly used for the walls, pillars, and gates of temples. In the Shinto religion of Japan, the gateways of temples, called torii, are traditionally painted vermilion red and black. The torii symbolizes the passage from the profane world to a sacred place. The bridges in the gardens of Japanese temples are also painted red, since they are also passages to sacred places. Red was also considered a color which could expel evil and disease. Some branches of the Asatru faith associate the color red with Thor. In Wicca, red candles that are used in rituals typically represent love, passion, anger and other strong emotions; transformation, liberation, truth and witchcraft. Red is often used in love spells. In Astrology, the color red is associated with the signs Aries and Scorpio. In the Chinese Zodiac, the symbols of the Rat and the Dragon are also associated with red. In chakra work, the Base Chakra, which is located at the base of the spine, is red; it “grounds the spirit to the body” and is associated with basic survival instincts. The Archangels Sammael and Sandalphon are also connected to the color red. Red is also associated with the planet Mars. It is also linked with the Ruby stone, the metal iron, and the musical note C.
I’ll have a post with information on the color orange next week for you all to read! 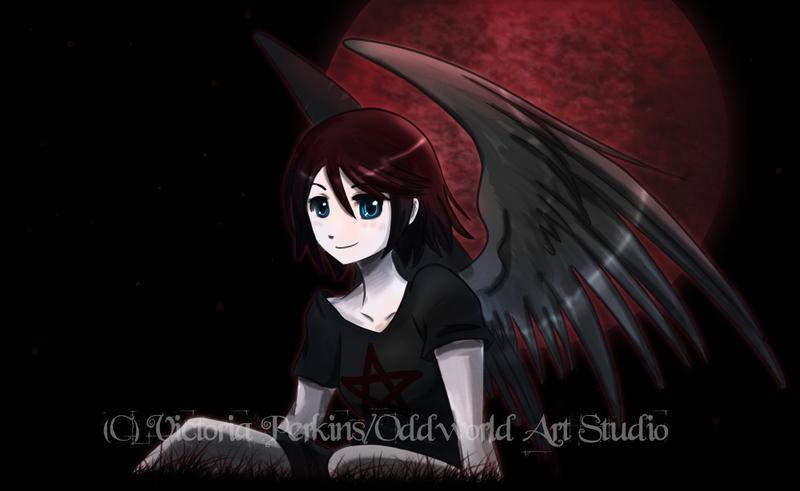 This entry was posted in On Color and tagged art, color, odd, oddworld, politics, psychology, red, religion, spirituality, symbolism, victoria perkins. Bookmark the permalink.